This blog is mostly dedicated for myself and I use it to keep track of my car’s odometer and other important information about the car. For example, it’s great to have a history of repairs, bought equipment, average fuel consumption and just for the fun of it, history of gas prices throughout the years. In February I drove a total of 1405 km. Odometer went from 93665 to 95070. 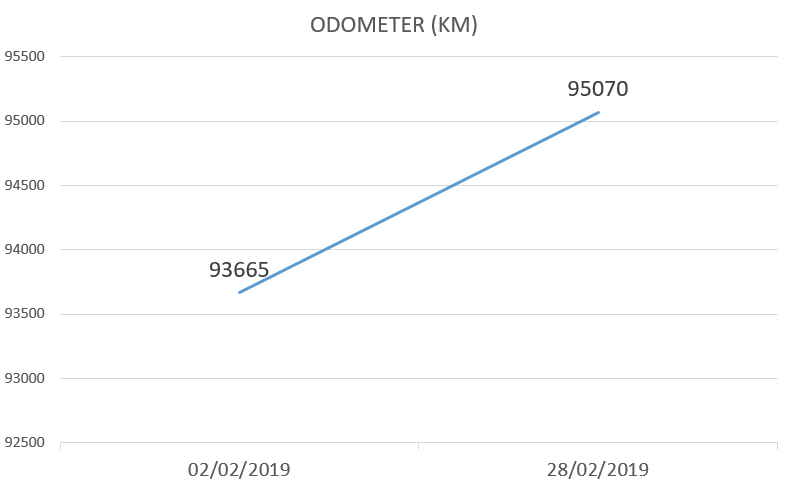 Even though February was short, I still managed to drive a lot and the average distance per day was 52.037 km. 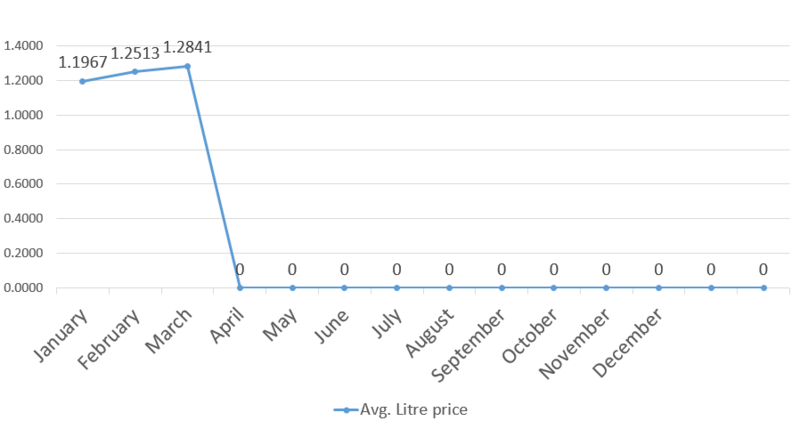 The graphic below shows the average refilling prices. As you can see the price has been steadily rising. 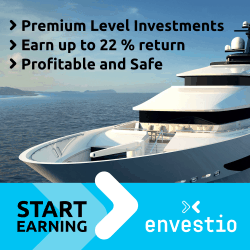 Estonia is notorious for high fuel prices and the prices are changing constantly. Sometimes even every hour. It’s made people quite furious and many of us, atleast the people who live near Latvian border, go to Latvia daily, because the prices are significantly lower + the cheaper liquor, building materials etc etc. It all adds up a pretty big chunk of money. More detailed overview of the refills in January and February. If you think the gas price in Estonia is high you should come to Greece. I usually pay around 1.5€ per liter and I drive a lot too. I would love to be able to fill up my tank at 1.25-1.30€ per liter. Anyway, good job on the car blog and it’s a nice idea to track your car’s expenses. Well the price might not be that high compared to other countries, but most importantly, how many litres could you get for an average salary? Estonians average net salary is a tad over 1000 euros and the fuel prices are ~1.3€/l. For example, Finland has 3000 euros average salary per month, yet the fuel prices are almost the same as in Estonia. This is an interesting post! I like the idea of keeping track of you car related expenses. If you’re interested in fuel efficiency and gas milage (and effectively getting the most out of your mileage), why do you refill your car so often? According to the data I could find on your car, it has a 60ltr tank. 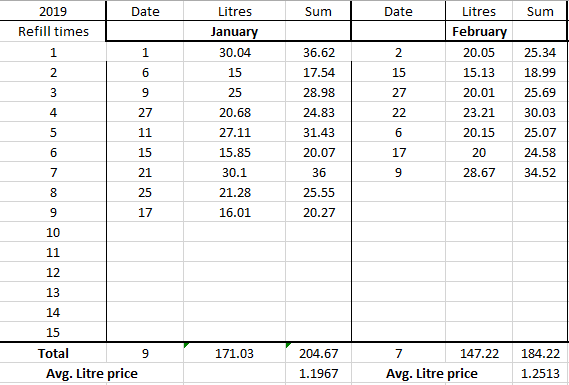 You averaged exactly 20ltr/refill in january/february. This basically means that you’re constantly halling around an extra 40kg of “overweight”. I realize that you’re most likely refilling whenever the price is cheap? – But perhaps you should try to do the efficiency calculations. For the moment being, I am refilling my gas tank not when the price goes down, but rather when I am very low on fuel (running on fumes is exhilarating). Luckily I have 4 gas stations in a 300 meter radius. And by gasing up only 20-30 litres at a time, I am keeping that overweight off my car. I usually aim to fill my tank half full just as you recommended and try to do that on days, when the prices are cheaper. For example, the prices always go down on weekends and the lowest prices tend to be on the sundays. Also, I enabled Toyota’s “ECO” indicator and if I keep that lit most of the times, I should see better numbers in the future. Anyways, thanks for showing that much interest and hope to see you around!